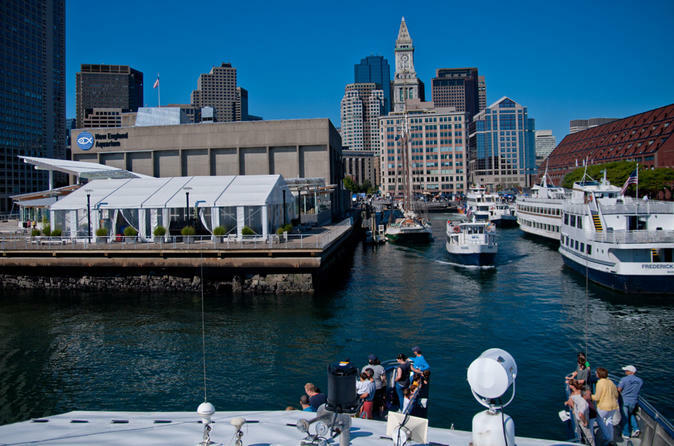 Whale-Watching Cruise: Departing from Central Wharf in Boston, board a high-speed catamaran and embark on your 3-hour whale-watching cruise. Your expert captain will take you to Stellwagen Bank National Marine Sanctuary, a rich feeding ground for whales, dolphins, sea birds and other marine life. From the three outdoor decks, you’ll get great opportunities to view dolphins, humpback whales, finback whales, minke whales and endangered right whales with the help of your naturalist guide, who’ll teach you about the behavior, conservation status and migration patterns of whales, dolphins and sea birds. In between your whale sightings, relax in the comfortable, climate-controlled indoor cabin, which features state-of-the-art sound and video systems, the New England Aquarium Education Station and a galley offering food and beverages for purchase. New England Aquarium Admission: Your Boston Super Saver also includes admission to the world-renowned New England Aquarium, a global leader in ocean exploration and marine conservation. Exploring the aquarium at your own pace, you’ll discover fascinating exhibits, educational programs and activities perfect for the whole family. Get up close to sharks, stingrays, penguins, seals, turtles, jellyfish and more!